So, lately, everyone has been talking about the blood moon that happened last night. Apparently, it is the last of it's kind until 2033. My husband and I kept going in and out of the house last night in hopes to catch it. I'll try to get another one in a few minutes. I finally went and got all set up, only to go outside and find the clouds had moved in...oh well, guess my 9 month old grand daughter will have to catch a picture next time...in 2033!!! So, what did we learn here, Terry? We learned to not be lazy and to do things right the first time around. I'll have to say, though, I didn't do too bad with this picture, but just think how much better it could have been it I'd done it right?! 92 More Days 'till Christmas! Only 92 days before Christmas! That would be 13 weeks and two days...YIKES! especially when you try to make things for gifts. This year, I'm not sure what I'm going to do for my far away family members, but I better get going with it, whatever it is. but there will be other items too. So, even though there are still 92 days until Christmas, and we have Halloween and Thanksgiving to get through, I need to get on the ball and get my act going. Almost a year ago, I did a tutorial on my tappingflamingo youtube channel on how to make these button flowers. I also talked about Trunk or Treat. Yesterday, I was rearranging some things and found this pitcher. I bought it at a garage sale for $1 years ago, and love it! I decided to add these button flowers to it, and am really happy with the way it looks. It now is the center piece to our small kitchen table. I love getting things people made themselves, including cards. When we lived in Kentucky, I had a friend that made her own greeting cards. They were very detailed and beautiful. I decided since I like to scrapbook, and have lots of fun paper, to start making my own cards too. Mine are not nearly as detailed as my friend's. They are very simple, but very fun to make. I like to pick out two sheets of paper that go together. One for the envelope (yes, I make the envelopes too), and one for the card. Above is an example of what I do; and yes, they can go through the U.S. Mail. A few months ago, a friend of mine got married. I made a card that went with the wrapping paper. As you see, I also made them a Christmas ornament out of guitar strings. Had to use LSU colors, since they lived in Louisiana, and most people are LSU fans. I love being creative, and making my own stationery is another way I can! I am debating....on whether to do an arts and craft show. The last time I did one, it was pretty unsuccessful, for everyone! I don't think it was well advertised, and the weather did not cooperate too well either. This past Saturday, our dulcimer group played at a fund raiser for our local humane society. It was the first time we played in public, and we had a lot of people stop and talk to us. They were pretty interested in this strange instrument that many had never seen before. Some even hung around and sang a little. It was fun. Well, I got to talking to someone about my jewelry, and how I would like to start selling it. I don't want to get into it in a huge way, just want to be able to create, share, and make some money to buy more beads to do more creating. This is when I heard about an arts and craft fair coming up in a few weeks. Currently, I have my craft room pulled apart because I am in the middle of pulling down wallpaper and painting. My bead stuff is everywhere, but I did manage to find some of the pieces I have put away for gifts, etc. Wow....I have quite a bit, so I'm really thinking about doing this event. I need to make a decision quick. I even did some crocheting with wire and glass beads. Oh, and there will be Christmas and Halloween stuff too. Oh, and some very different pieces too, like this necklace made of chain, sari ribbon, and hand made clay beads. Here is part 1 of our eight day cruise on the Carnival Sunshine; August 29 - September 6, 2015. We went to St Maartin, St Kitts, Puerto Rico, Grand Turk, and three days at sea. This first video tells of our days at sea. Future videos will be about our ports of call. Hope you enjoy! There was one huge apple in the bag though, the size of a very large grapefruit. I decided to make some fruit salad with these apples, and would like to share my grandmother's recipe with you. You will need apples, bananas, celery, pecans or walnuts, pineapple, small marshmallows, a 20 oz can of chunk pineapple (save juice), and mayonnaise or salad dressing. Cut up the bananas, apples, and celery and put them into a large bowl. Open the can of pineapple. Drain the juice and set it aside for later. Dump the pineapple into the bowl with the rest of the fruit and celery. Pour the marshmallows (about 5 or 6 oz) into the bowl. Rough chop the nuts (I usually use walnuts, but this time I had pecans on hand, so that is what I used). Dump into the bowl. Okay, so this part is a guesstimate. Put about 1/4 cup (+ or -) mayo or salad dressing into a small bowl. Slowly add a LITTLE of the reserved pineapple juice. You will NOT use all of the juice. Whisk the mayo and juice until it is the consistency of dressing you would put on your green salad. Pour that over the ingredients in the bowl and mix together. Put into the fridge for a couple of hours, then enjoy. It is best fresh, but seldom will you have leftovers, that is unless you make a boatload. Oh, so what do you do with the left over pineapple juice? This is what you do with the left over pineapple juice! YUMMMM! Has anyone mentioned, I like Flamingos? Boy did I get on that post quickly! I just happened to be on Facebook at the time she posted. A week ago, I got a text from her mom. She had driven the 1500+ miles out there and was wondering if I still wanted them. Funny thing is, I had just gotten off an eight day cruise. If she had tried to get in touch with me just even hours before, I would not have gotten the message. and some mugs for our hot chocolate. My husband will like these, because the are pretty big. He always likes to drink a big glass of hot chocolate. So, there you have it, my new set of dishes. Tomorrow I will be clearing out a special place for them to be displayed. 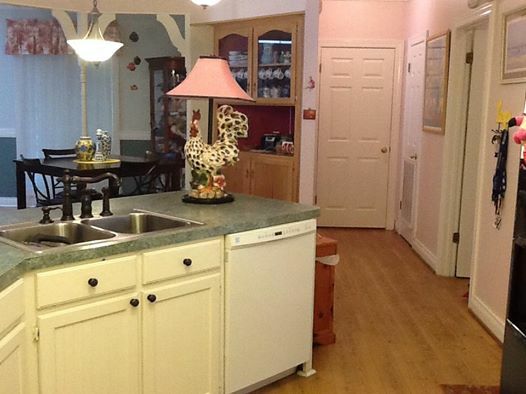 The kitchen wasn't too bad, except for the pink and white candy striper wallpaper. For those of you who do not know what a candy striper is, well, according to the dictionary it is a teenage girl who does volunteer nursing in a hospital. A long time ago, they were pretty popular, and they wore dresses that were pink and white pin stripe. We bought our home and moved in this past January. 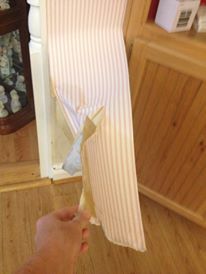 There is A LOT of wallpaper in the house, and we knew we would be taking it down....little by little. Something else that was in the kitchen that we thought we were not a fan of was this rooster. I named him Rudy, and over the months, he has grown on me. I fretted over this project for several months. Our house was built in 1989, and I was sure the wallpaper was put up when the house was built, so, therefore, would be on bare drywall. Well, I was not completely right on that. 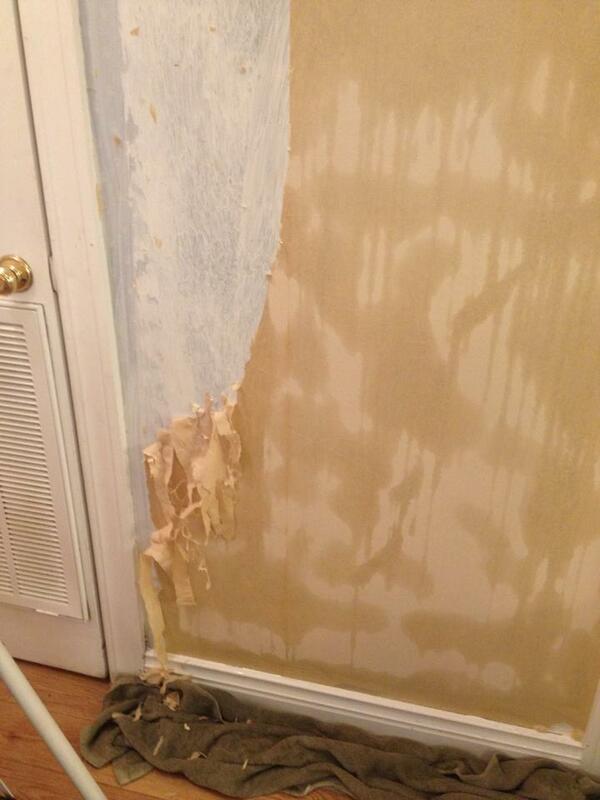 There were actually TWO layers of wallpaper, the first layer being primed over, then the bare drywall. UGH! I called various painters and wallpaper people. Only two showed up, and then never got back with me with an estimate. I was on my own. I did a lot of research, and found that I needed a great deal of patience and time. It was very tedious work. Eventually, I was able to get it all down. My husband came in, prepped all the walls and painted. We now we have a nice bright kitchen. I chose a pale yellow. We have been married for over 32 years, and I always wanted a yellow kitchen, so now I have one, and I love it!! !